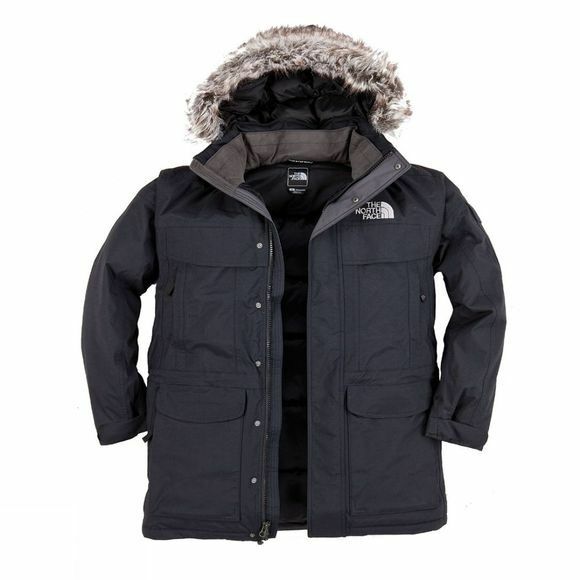 The North Face Men's McMurdo Parka is an iconic insulated and waterproof parka for demanding winter conditions. A winter favourite and best seller, the parka has 550 fill down insulation, a waterproof, breathable and fully seam sealed shell and comfortable taffeta lining. Hunker down with the hood pulled up or remove it altogether. The faux fur trim is removable as well. Storage is well accommodated with generous pockets inside and out and on a sleeve. Adjustable drawcord system at the waist and hem and hook and loop adjustable cuffs. Embroidered logos front and back. For a burly iconic parka that is technical dialled for winter, choose The North Face Men's McMurdo Parka.